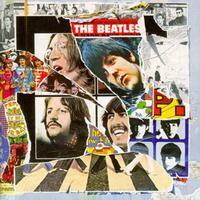 The Beatles Anthology 3, the third and final chapter in the band's historic Anthology collection, was originally issued in October 1996. It comprises 50 songs including first takes, out-takes, and never-before-heard recordings from the period of 1968-1970. This was the time of The White Album, "Let It Be" and Abbey Road and it features "stripped bare" alternative versions of Beatles classics from that period, including "Helter Skelter," "Come Together," "Hey Jude," "While My Guitar Gently Weeps," "Glass Onion," "Don't Pass Me By" and "Something." Anthology 3 also includes Beatles tracks never released by the band prior, among them "Not Guilty," "What's the New Mary Jane," "Teddy Boy" and "Come and Get It." And, revealed for the first time, Anthology 3 features seven tracks from the Beatles rarest private tape: acoustic demo sessions for The White Album, recorded not in the studio but at George Harrison's home. The Beatles "at home" tracks are: "Happiness Is A Warm Gun," "Mean Mr. Mustard," "Polythene Pam," "Glass Onion," "Junk," "Piggies" and "Honey Pie." The three Anthology sets were designed to beat bootleggers at their own game. More than any other artist — more than Bob Dylan, more than Pink Floyd, more than Bruce Springsteen — the Beatles' outtakes, session scraps and tossed-off fragments were hoarded and cherished by collectors. Still, Anthology posed itself as more than just a vault-clearing project (like Dylan's Bootleg Series). The Anthology series stands as a comprehensive document of the second coming of rock & roll. The best of these tracks — some live versions, some fragments and others mere dialogue — reveal a side of the group's history that was left undocumented, at least officially, for more than a quarter-century. 22. What's the New Mary Jane?